He could become second Gitmo detainee to face federal charges in U.S.
WASHINGTON (CNN) -- Administration officials Friday indicated a second Guantanamo Bay detainee may be brought to the United States for a criminal trial, but cautioned no final decision has been made. Officials say they are committed to keeping President Obama's promise to close Gitmo by next year. 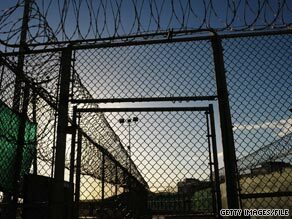 Justice Department officials said they continue to review the case of Afghan detainee Mohammed Jawad, who has been held at the Guantanamo facility for more than six years. "The attorney general has now directed that (Justice) Department prosecutors expedite their review of his case so the department can decide whether evidence exists to support a criminal case in federal court. We will make that determination as soon as possible," said Justice spokesman Dean Boyd. In the meantime, Jawad will continue to be held at the Guantanamo Naval facility, but not as a wartime prisoner. The Justice Department disclosed in a federal court case in Washington that prosecutors have decided not to rely on Jawad's statements to Afghan and U.S. interrogators as evidence in his case. Boyd said prosecutors have reviewed evidence previously unavailable to the court, in which an eyewitness says he saw Jawad throw a grenade that wounded two American service members in Afghanistan. Last year a judge threw out statements by Jawad in which he first denied throwing the grenade at the military jeep, but later confessed to Afghan authorities when they threatened to kill him. Jawad's ACLU lawyer Jonathan Hafetz criticized the government, saying Jawad "continues to languish at Guantanamo." Bergen: How many Gitmo prisoners return to fight? "The issue is did he throw a grenade or not. The only evidence the government has presented...was obtained by torture," Hafetz said. "Now rather than send him home to Afghanistan they are trying to manipulate the legal process" by possibly moving it to criminal court in the United States, Hafetz said. If the United States decides to bring Jawad to Washington for a criminal trial, he would be the second Guantanamo defendant brought to U.S. soil to face federal charges. Previously, officials brought Amed Ghailani to New York, where he will stand trial for charges stemming from the bombing of U.S. embassies in East Africa in 1998. Word of a possible trial for Jawad came on the same day top Justice and Defense officials told a skeptical congressional committee the administration will continue with plans to bring some of the remaining 229 Guantanamo Bay detainees to stand trial in U.S. civilian courts. Assistant Attorney General David Kris and Defense Department General Counsel Jeh Charles Johnson said that they remain committed to keeping President Obama's promise to close the Guantanamo facility by next January. They told Congress in order to do that they will bring some prisoners to an undetermined location for trials by military commissions and hold others in long-term custody without trial possibly until the end of the war against al Qaeda and the Taliban. Republican lawmakers criticized the plans and urged administration officials to keep the Guantanamo facility open to save money and to protect the American public from dangerous criminals. Republicans and Democrats alike earlier blocked the administration's plan to release any of the detainees eligible to be freed.